I had a few Granny Smith apples lying around my kitchen that weren't getting eaten. I'm typically an "apple a day" girl, but for whatever reason, Granny Smiths are one variety I can't really stomach on their own. Dip them in caramel and I'm game, but my keyboard at work is dirty enough without me dripping caramel all over it! 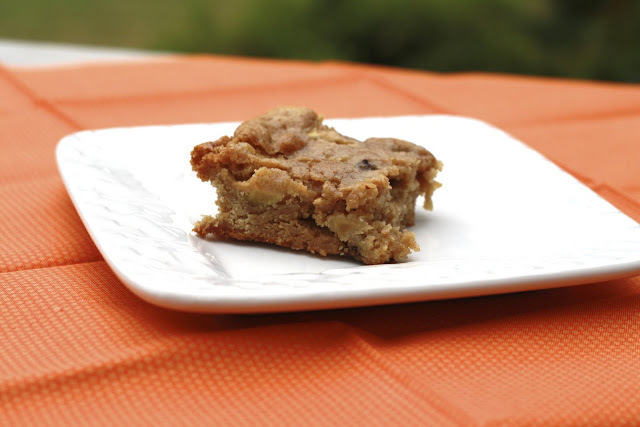 When the October issue of Family Circle arrived in my mailbox, I immediately turned to flip through the recipes and saw these apple raisin bars: Granny Smith problem solved. I whipped these up after work one day with the intention of bringing them to church later that weekend...and then found myself stealing slivers from the pan for the next 36 hours! These were more fudgy than cakey, almost doughy in the middle. I prefer my baked goods like this, but if you want them to set up a bit more, you may want to bake a few extra minutes (I took mine out after 35 minutes). Full of cinnamon and apples, they're the perfect dessert bar/pseudo breakfast for Fall! Now I want to try combining this recipe with my oatmeal raisin bar recipe to get an Apple Oatmeal Raisin bar. I'll post if I give it a try! 1. Preheat oven to 350F. Line a 9 x 13 inch pan with foil and spray with cooking spray. Set aside. 2. In a medium sized bowl, whisk together flours, baking powder, cinnamon, and salt. 3. In a large bowl, beat sugar, eggs, butter, and vanilla with an electric mixer until smooth (approximately 3 minutes). 4. With mixing speed on low, gradually add flour mixture stirring just until incorporated. Stir in diced apples and raisins. With a spatula, spread batter evenly into prepared pan. 5. Bake at 350F for 35 minutes or until an inserted toothpick comes out clean. Cool completely before cutting into bars and serving.